Arsenal to pursue Jean-Philippe Gbamin this summer? 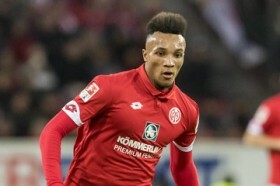 Arsenal are reportedly prepared to make a fresh attempt to sign Mainz defender Jean-Philippe Gbamin at the end of the ongoing campaign. The Gunners were looking at the prospect of signing the 23-year-old during the 2018 summer transfer window but a deal failed to materialise before the deadline. Unai Emery's side thereafter could not lodge a winter approach for the centre-back amid their lack of transfer funds but they are likely to revive their pursuit in four months' time, The Mirror reports. However, any new signing is expected to coincide with a potential departure, given Emery is deemed to have been allotted with a limited budget of just £45m for the summer. Shkodran Mustafi is currently the leading candidate who has been tipped to make way for a new central defender after failing to produce positive performances on a consistent basis for the club. Arsenal are presently fifth in the Premier League standings but they are still in the running for the Champions League positions with just one point separating them from fourth-placed Manchester United.